If you want a top-of-the-line SUV with serious performance capabilities, look no further than the Volkswagen Group. Its Porsche unit has had tremendous success with the Cayenne, a vehicle that has doubled its sales all on its own – and that's not even accounting for the Volkswagen Touareg or Audi Q7 that share some of its underpinnings. Keen to capitalize on that success, the German auto giant is overseeing the application of the same formula to two of its other divisions: Lamborghini, which just unveiled its new Urus concept, and Bentley, which is working on an SUV of its own. The British marque has been showcasing the EXP 9 F concept to preview what it has in store. It only hinted at powertrain possibilities upon its unveiling at the Geneva Motor Show, but at the Beijing Motor Show, it got ever so slightly more specific. Like the Continental range, the production version of the Bentley sport-ute would pack a 600-horsepower, 6.0-liter twin-turbo W12, but offer the (relatively) more sensible 500hp, 4.0L twin-turbo V8 as well. 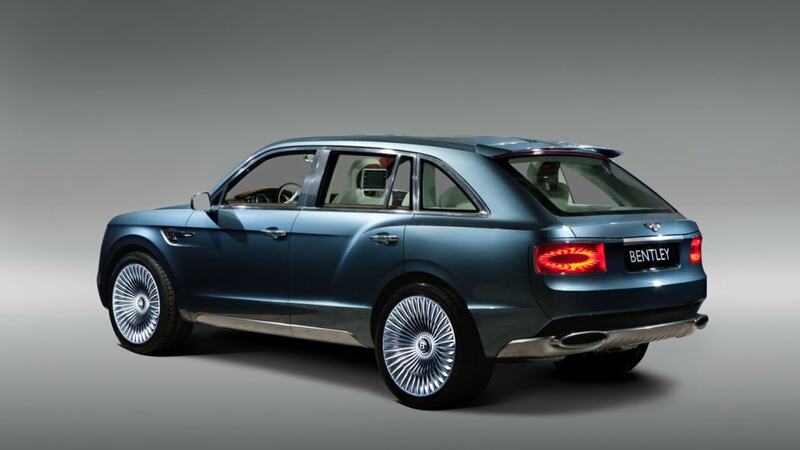 The bigger news, however, is the V6 plug-in hybrid option which Bentley is planning for its SUV, enabling it to travel up to 30 kilometers (18.6 miles) on electric-only mode, while rocketing to 100 km/h (62 mph) in less than five seconds. Bentley projects the variety of powertrain options will help it sell 3,000 units of the vehicle once it enters production in 2015 – the same figures sister-company Lamborghini is projecting for the Urus. To put that into context, consider that Bentley sold just over 7,000 vehicles (from its current Continental and Mulsanne lines) around the world last year. That's still a far cry from the number of Cayennes that Porsche churns out – it delivered nearly 13,000 of them in the United States alone last year – but then the EXP 9 F is expected to carry a price tag north of $200,000 (double the price of even the most expensive Cayenne Turbo) while sharing common components to make its first entrance into SUV market a lucrative one for the Flying B brand. Scope out the fresh high-resolution images we've added to the gallery above for another look at the EXP 9 F (which is still expected to look different by the time it comes to production), and scroll down for the press release containing powertrain information. - A range of advanced powertrains under consideration include 500bhp, 4.0 litre V8 Twin turbo, a V6 plug-in hybrid, in addition to the flagship 6.0 litre W12 engine. - An innovative fusion of contemporary, crafted luxury, advanced in-car technology, commanding driving position and all-terrain capability. 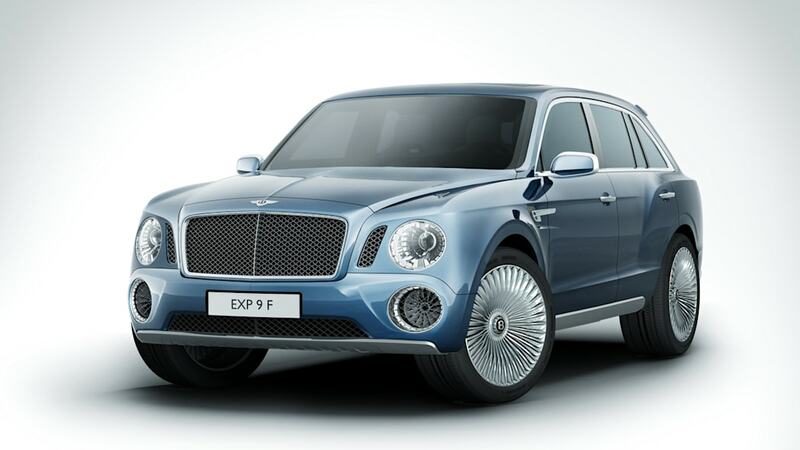 Bentley is offering a vision of the future with a dramatic new Sport Utility Vehicle concept, EXP 9 F, at the 2012 Beijing International Automotive Exhibition. 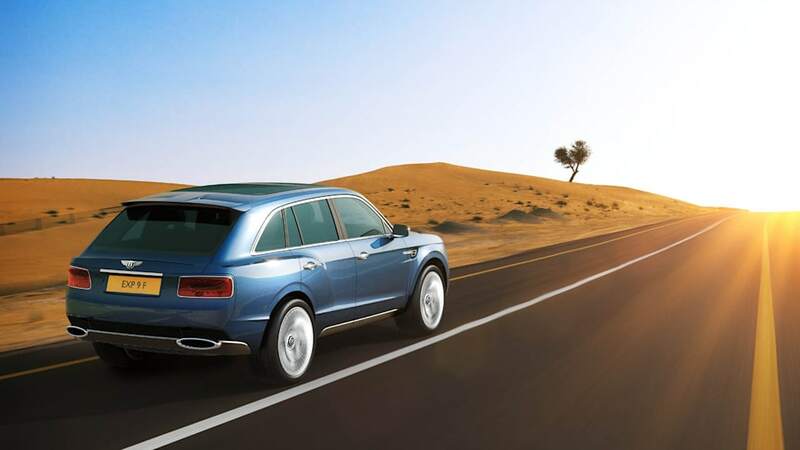 The Company's designers and engineers have created a compelling new take on the Grand Touring Bentley – a vehicle that feels equally at home at an opera gala performance, on the sand dunes and the overtaking lane of the autobahn. Today a global luxury brand with a network of 160 dealers from Shanghai to Beverly Hills, Bentley has an increasingly diverse customer base spanning every continent. 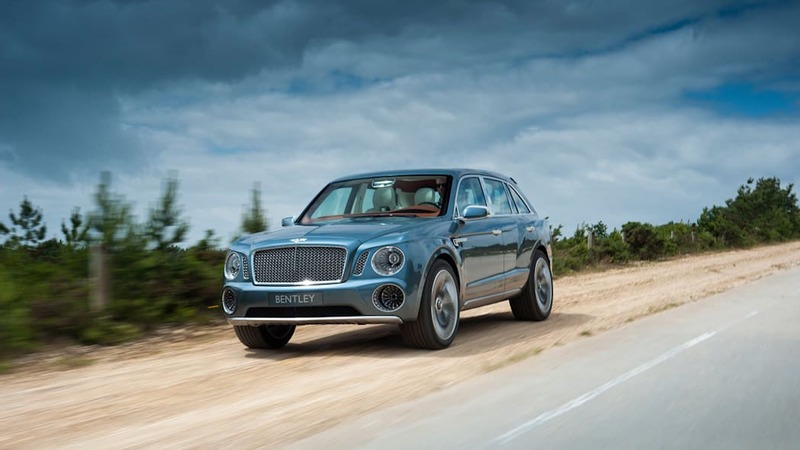 For many customers, a dramatically styled, Bentley all-wheel drive SUV which combines a spacious, versatile cabin and commanding driving position, with Bentley's hallmark power, performance, advanced technology and hand crafted luxury, would be a natural choice both on and off-road. 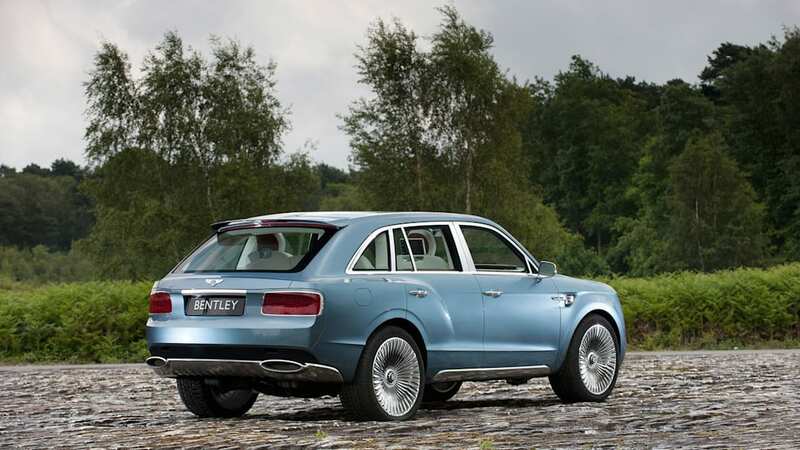 The new pinnacle-luxury Bentley would offer exhilarating performance, setting new benchmarks for the SUV sector. The EXP 9 F concept on display in Beijing is based around the Bentley 6.0 litre, twin-turbocharged W12 petrol engine, developing 600bhp and 800 Nm of torque coupled with an 8-speed close-ratio transmission. A range of other powertrain options are also under consideration. 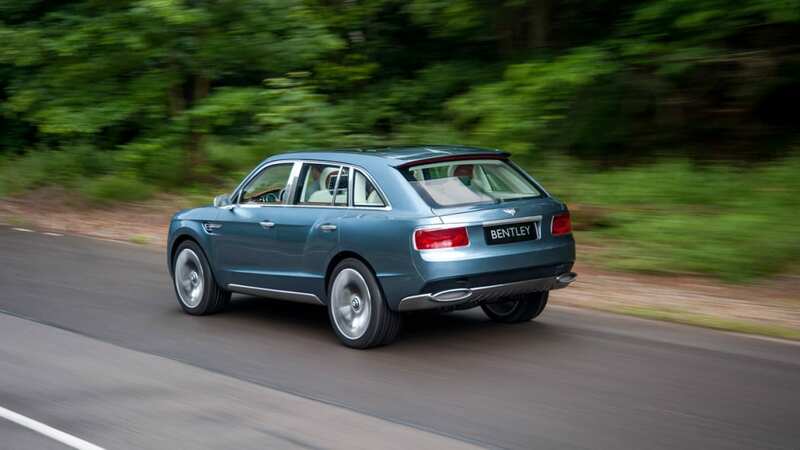 This includes Bentley's recently launched 500bhp, 4.0 litre petrol V8 as well as a groundbreaking powertrain for the luxury SUV segment – a V6 plug-in hybrid. With a potential 30km range in full electric mode and CO2 emissions of 130g/km, the V6 hybrid would still be capable of a 0 to 100km/h sprint time of less than 5 seconds. 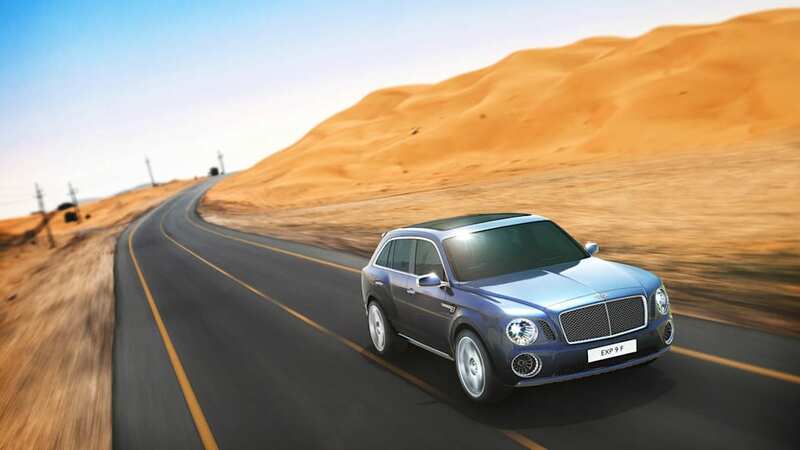 "We are very excited by the potential of a high performance, ultra-luxury Bentley SUV. Since we first showed EXP 9 F at Geneva, the response has been overwhelming. 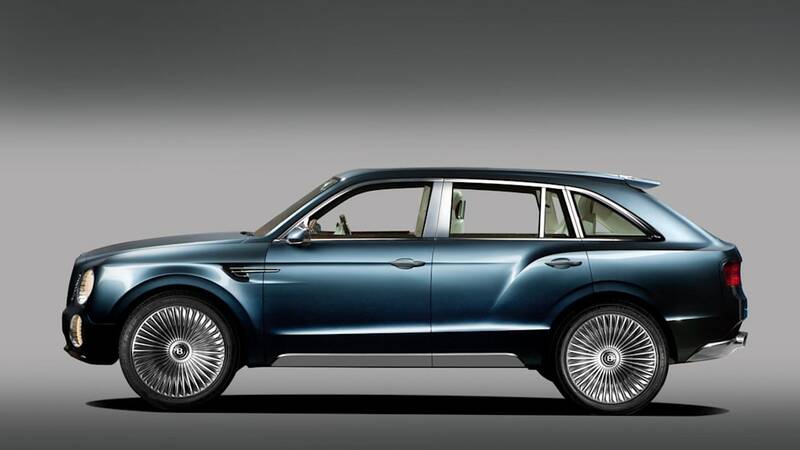 Everyone seems to agree that an SUV is a natural fit for Bentley. 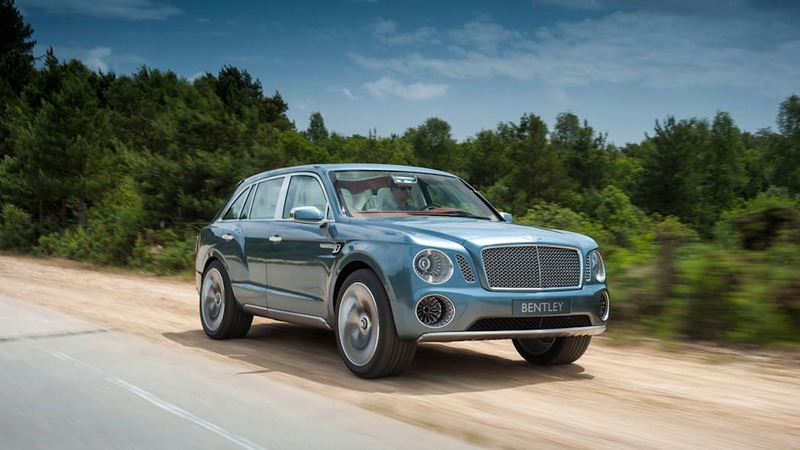 An exciting range of drivetrain options including a hybrid V6 are under active consideration but one thing is for sure, any Bentley SUV would offer the thunderous performance for which the marque is renowned." Wolfgang Dürheimer, Chairman and Chief Executive, Bentley Motors. "EXP 9 F had to represent the absolute pinnacle of the sport utility sector, setting a new benchmark for this type of vehicle. 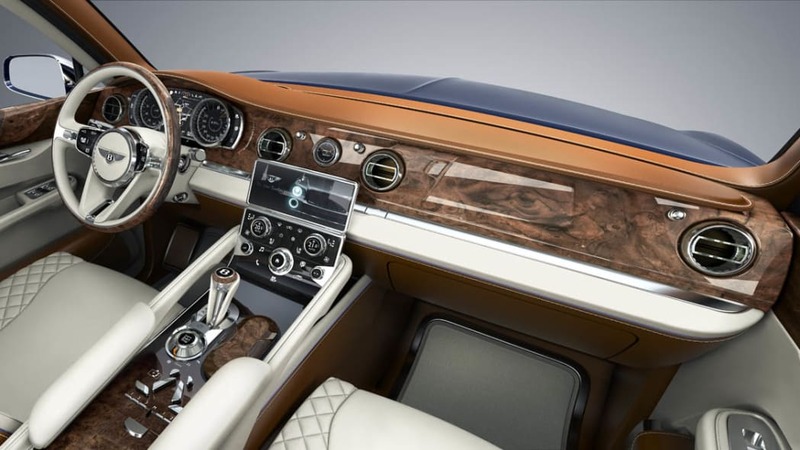 The style had to reflect Bentley's sporting character despite its radically different package and purpose together with sculptured, flowing surfaces in keeping with the Bentley tradition." 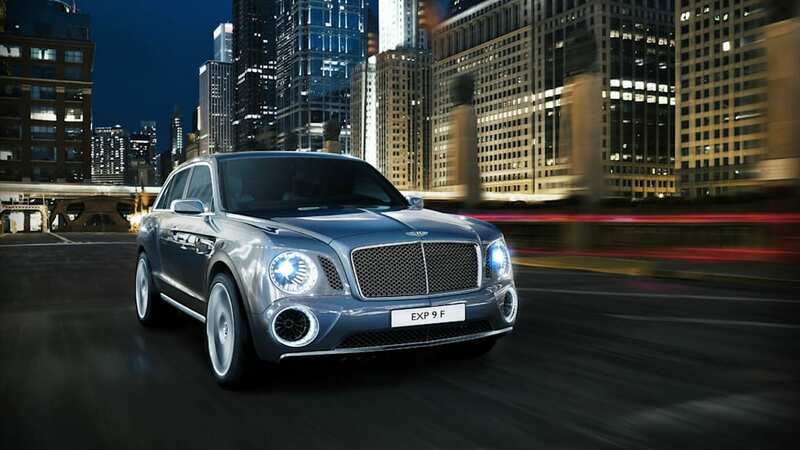 Key Bentley cues such as the matrix grille, round lamps and the strong power-line and haunch along each flank are reinterpreted for EXP 9 F. The 'hewn from solid' design language and innovative detailing, emphasise the robust character of this high-luxury SUV. The designers were inspired not only by the more functional nature of EXP 9 F but by the 'visible engineering' of the famous Blower Bentleys. For example, the day-time running lamp apertures also act as the charge cooler air intakes for the twin-turbo W12 engine, each with a dramatic, mesh-covered turbine fan design and 'rifled' inner surface finish. The turbine theme continues with the stunning 23-inch alloy wheels, the design of which complements the sculptured coachwork. 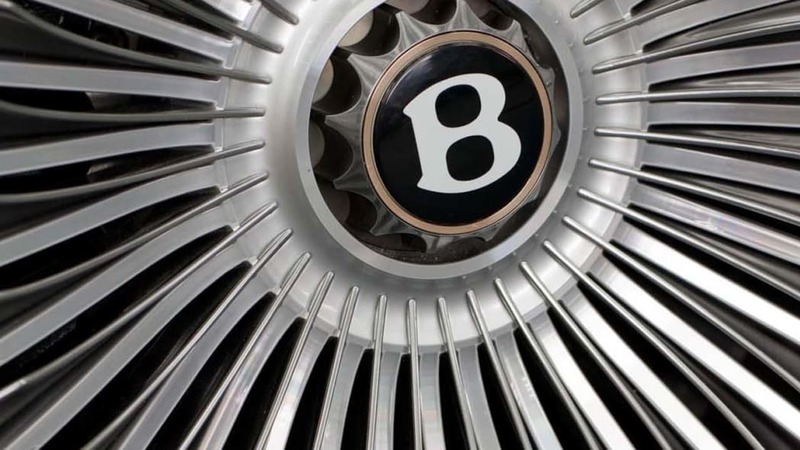 The multiple spokes are reminiscent of the shape of turbine fan blades while the centrally mounted wheel nut is a visual reference both to Bentley's Le Mans racers of the 1920s with centre-lock spinner and to the single nut found on the modern-day Speed 8's high-tech racing alloys. At the rear, the swooping lines of the tailgate avoid utilitarian overtones in favour of a distinctly sporting profile, while the ultra-wide, two-part split tailgate offers a high level of versatility when grand touring. The bold design language of EXP 9 F is complemented by twin exhaust tailpipes with 'rifled' inner surfaces, their elliptical shapes echoing those of the rear light clusters. "The challenge for the interior design team was to create a cabin which provides a blend of luxury and utility. The result is a light and airy environment with a commanding view of the road and a versatile layout which showcases Bentley's craft and design language in an innovative and contemporary way." 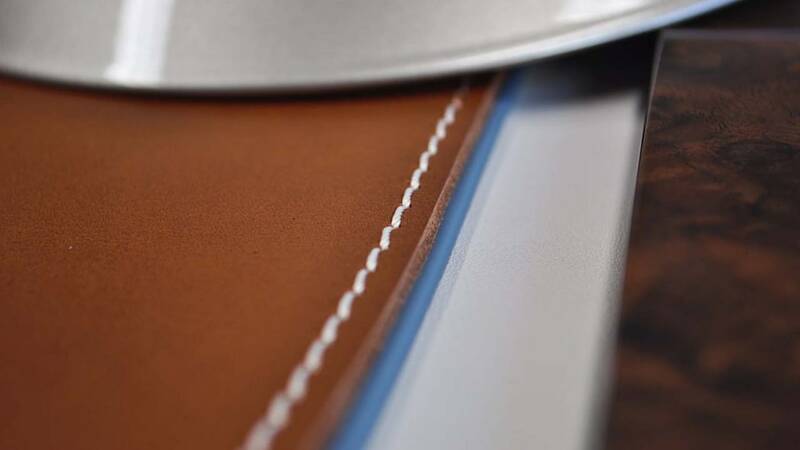 Traditional handcrafted elements such as wood, leather and polished metals such as aluminium, bronze and gunmetal are used to create a sense of British luxury, yet the way they are used sets a fresh and contemporary interior ambience. 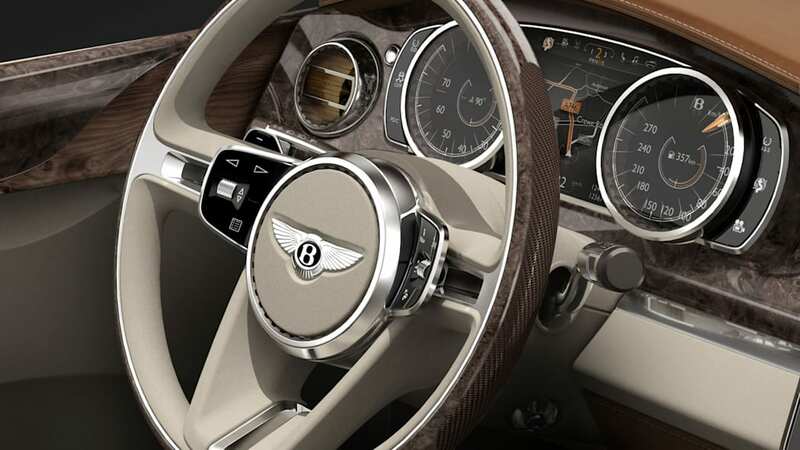 Soft-touch leather contrasts with highly durable surfaces with the concept car design experimenting with the use of saddle leather for the seat backs, top roll and loadspace – while analogue bezels and dials are paired with TFT 'virtual' instrumentation. The upright dashboard design features a full-width, one-piece wood veneer with a subtly negative surface and instruments with a configurable display. The fluid waist rail design shows pinnacle craftsmanship with chequered, lacquered and oiled finishes. Veneers are sculpted to reveal their solid wood construction. The highly distinctive, carved checkering design on the steering wheel rim, inspired by a shot-gun's stock, also offers additional grip. Traditional Bentley 'bulls eye' vents have a 'rifled' gunmetal inner surface for a more contemporary and functional appearance. 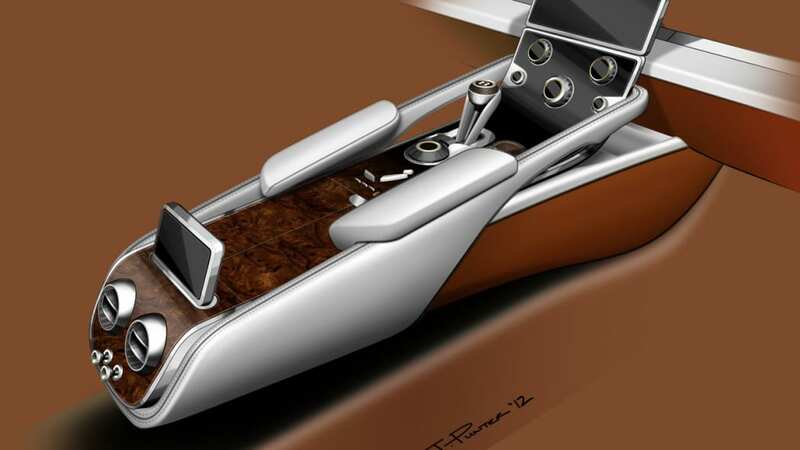 The centre console is a blend of functionality and supreme ergonomics with dynamic, architectural layers which help to create a central spine to the cabin. The frame of the console is also a structural component with integrated, sculpted grab handles. The high-gloss black touch-screen surround seamlessly blends into a lacquered veneered surface, emulating the decorative surfaces of a Stratocaster guitar. 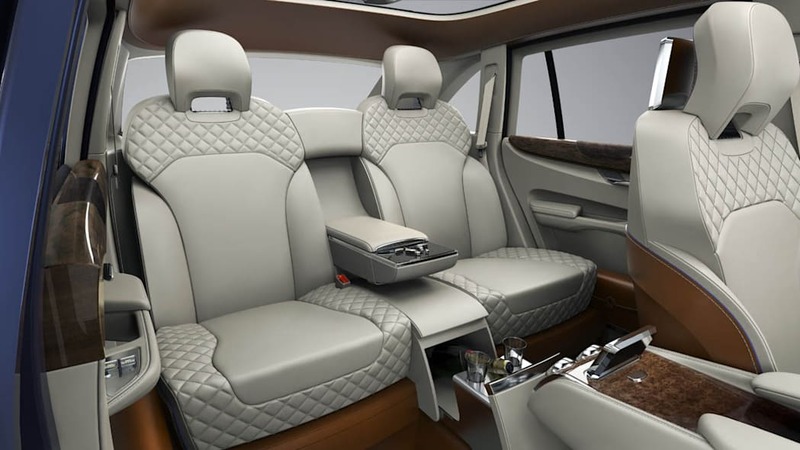 Rear seat passengers can chose between business mode, with generous legroom complete with fold-down keyboard and full internet connectivity via an iPad or tablet or a more reclined position with powered footrest, drinks table and an infotainment screen for movies. A removable Touch Pad located on the centre console manages the rear cabin climate control system and entertainment functions. 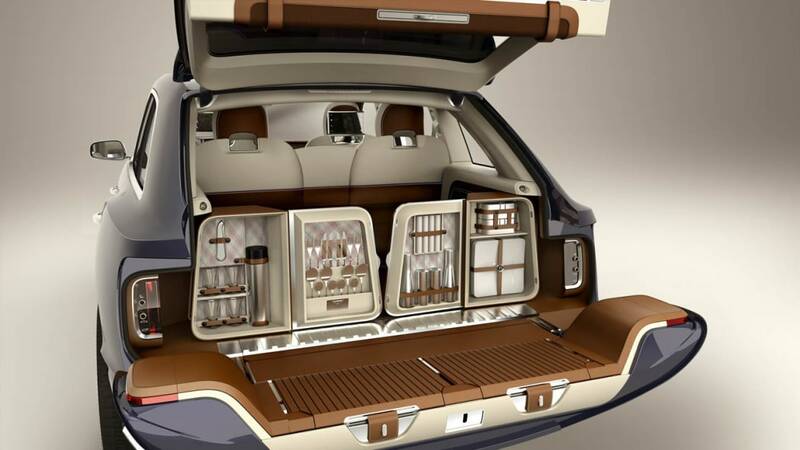 When the rear seats are not in use, they can be powered forward to create a larger loadspace for sports equipment or luggage. The EXP 9 F seating is 4+1, with a rear armrest sitting between the two electrically operated 'Captain's chairs'. Seats feature a diamond-quilted 'shoulder line' in soft-touch leather, echoing the traditional appearance of a British field sport jacket. 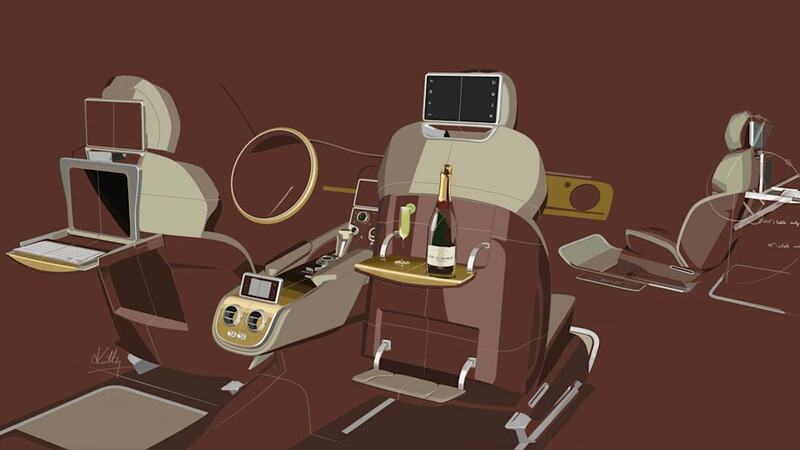 A sliding drawer between the seats reveals a cooled compartment for champagne and glasses. Micro leather piping accentuates the lines of the dashboard, centre console and seats and is colour-matched to the coachwork. At the rear, the lower section of the two-piece tailgate may be used as a viewing bench or picnic table with the upper section providing a canopy to provide protection against the elements. Bespoke picnic hampers are stowed neatly to either side of the load space when not in use, but are located on rails for easy access. An awning extends over the tailgate to protect those seated there; two umbrellas fit into stowage compartments in the rear luggage area for when the rain clouds sweep in. These compartments are heated for rapid drying of wet umbrellas. 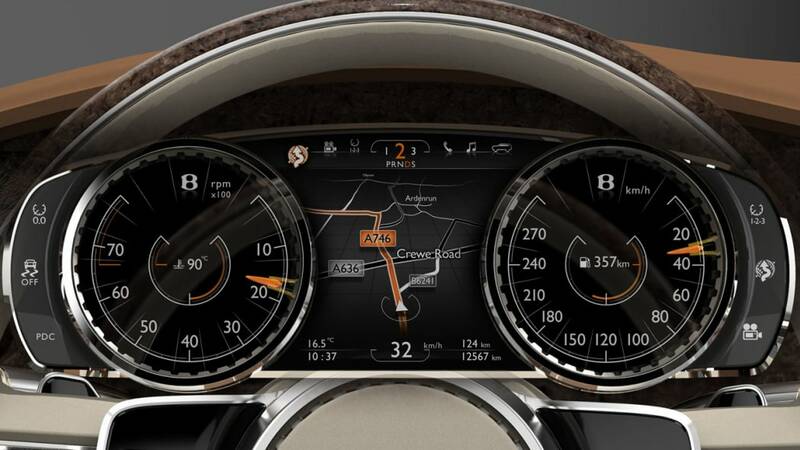 As a result, EXP 9 F places key driver information such as 3D navigation in a central TFT panel directly in the driver's line of sight, where it is flanked by two analogue reverse-read dials. Meanwhile, controls that are shared between driver and front seat passenger, such as cabin temperature, air vents and entertainment, are presented in the central touchscreen and console. The TFT screen deploys from the full-width metal trim to provide a fully integrated extension to the glass surface of the centre console. Three different driving modes – Comfort, Sport and Off-Road – are selectable according to the road environment and type of journey. Thus the driver information TFT panel would be able to switch between satellite navigation on the motorway to a 'sump cam' when negotiating a bumpy track. For sand-dune driving, the speedometer is automatically replaced by a compass while, for high altitude driving, the rev counter is replaced by an altimeter. 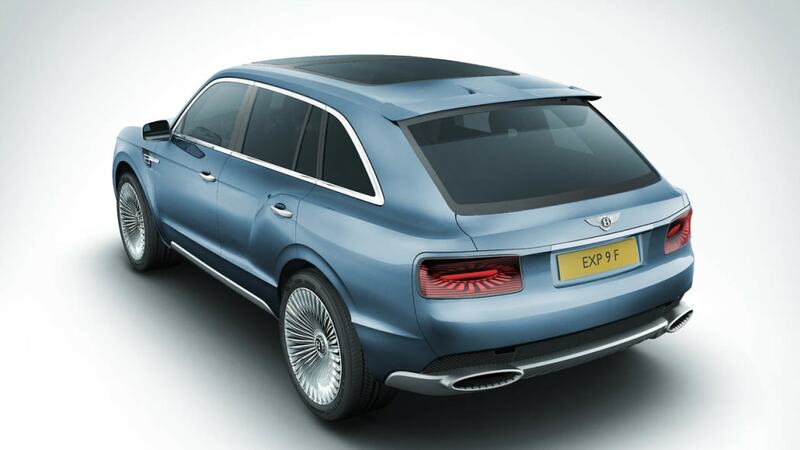 EXP 9 F represents the chance to take Bentley values of design, craftsmanship and engineering excellence into what would be – literally – new terrain for the brand. 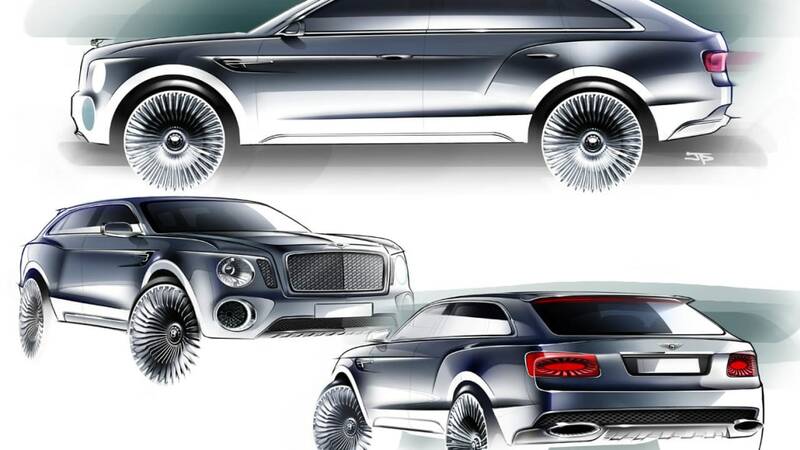 Bentley's experience with the all-wheel drive Continental range makes the concept of a Bentley SUV a natural progression for the company. "A Bentley Grand Tourer doesn't necessarily have to be a coupé, a convertible or a saloon – it could equally well be an SUV. What's important is that it should be true to Bentley's brand values and in line with the desires and needs of our customers." – Alasdair Stewart, Member of the Board, Sales and Marketing. 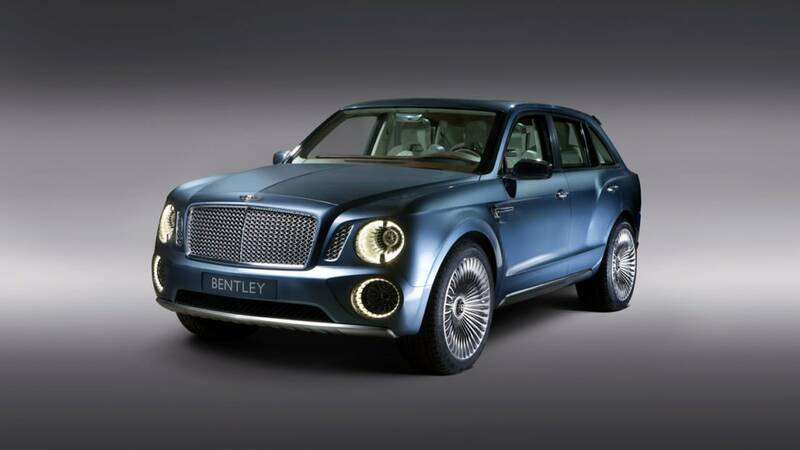 News Source: Bentley via Automotive News Europe - sub. req.